Above, Jack Nicklaus, winning the 1986 Masters at the age of 46. 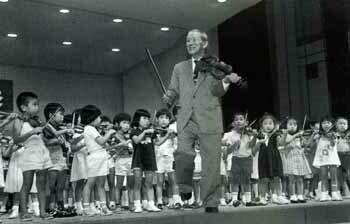 Below, Shinichi Suzuki with violin students. How are they connected? Read on. The 1986 Masters ended on April 13, so I’m jumping the gun a bit on its 25th anniversary. But that’s because Geoff Shackelford is running a contest over at his golf blog, deadline tomorrow, in which readers are invited to tell “where you were, who you were with, or of course, your horror stories about missing out on the great day.” My story is one of the “missing out” ones. I want to be sure to enter it, so I will write it tonight for Ron’s View and submit it tomorrow to Shackelford. He has a 500 word limit, which will keep this short. Gail and I were nine and a half months into our marriage. She was not yet the devoted Masters fan she would become. Indeed, she wasn’t much of a golf fan at all. Thus, when we realized that Masters Sunday was also annual Seattle-area-Suzuki-violin-student-mass-concert Sunday, which meant eight-year-old Jessica (Gail’s daughter, my new step-daughter) would be performing at the same time that the leaders played the final round’s back nine at Augusta, Gail wasn’t too concerned. The concert was held at Meany Hall on campus. Back then, and until recently, the Masters didn’t let CBS start TV coverage too early, and there were no cameras on the front nine. I don’t remember the details, but I imagine we left for the concert shortly after coverage started. 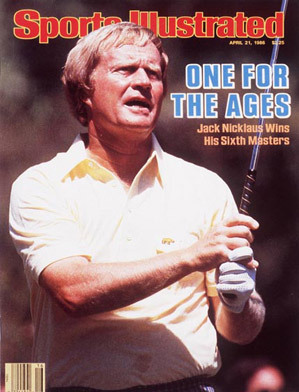 Golf fans know that NIcklaus’s win was one of the great surprises in golf history. Six years past his last major championship, NIcklaus could still contend, but no one expected him to win a major again, except perhaps Nicklaus himself. Then, after shooting 35 on the front nine, he exploded for a 30 on the back nine and took the lead. I missed his entire back nine, of course. I was in Meany Hall at the concert. Suzuki fans know that all Suzuki students learn the same repertoire in the same order, starting with Twinkle, Twinkle, Little Star. In a carefully controlled progression, students advance from simple songs to Bach. The concert format has the most advanced student in attendance playing the latest piece he or she has mastered, then proceeds backwards through the repertoire, with students coming on stage as their latest pieces arrive, building to the climactic moment when all of the dozens or hundreds of area students are on stage playing Twinkle, Twinkle in unison. It’s wonderfully conceived, no? Once I caught on to this conception and realized that Jessica, still a relatively new Suzukier, wouldn’t be playing for a while, I leaned over and suggested to Gail that I walk over to the HUB — the student union building — to see what was on in the TV room. It’s not that I wanted to leave the concert. The format was fun, and I enjoyed seeing students come on the stage in twos and threes. But, you know, there was golf to watch. So off I went to the HUB, and I was mighty relieved to find that the students in the TV room had indeed tuned the TV to the Masters. It was difficult at first to make sense of what was happening. There was all this talk about Jack, but he was done playing. He was being interviewed, and he seemed pretty happy. Golfers were still on the course. Eventually I came to understand that only one golfer could still catch him: Greg Norman, who had entered the day in the lead but fallen back. Tom Kite must have finished already, one stroke back of Nicklaus. And Seve Ballesteros, two back. And Nick Price, three back. Whatever drama had taken place with these players in the hunt or falling back, however Nicklaus found himself atop the leaderboard, I knew none of it. I knew only that Norman had just birdied 17 to move into a tie with Nicklaus and was now on the 18th tee. In fact, I probably didn’t even know that at first, but had to get caught up along the way as Norman played 18, learning of his falling out of the lead, Nicklaus’s tearing up the back nine to take the lead, Norman’s steadying himself to regain a piece of the lead, and now playing for a win or at least a playoff. A good drive, an errant approach shot missing the green, a chip onto the green with 15 feet left for a par-saving, playoff-saving putt. A miss. Nicklaus had won! Norman was joint runner-up with Kite. What many consider the greatest golfing moment of the last 30 years was over, and I hardly knew what happened. I returned to Meany Hall in time to see Jessica’s entrance. Just as with the golf, I missed a lot of the action on the back nine, but I did see the conclusion. And in contrast to Greg, Jessica didn’t bogey “Twinkle, Twinkle.” All went well. Except that I couldn’t get Gail to understand that I had missed history.